Generate more qualified B2B sales leads for your salespeople, representatives, distributors or resellers with effective print advertising. 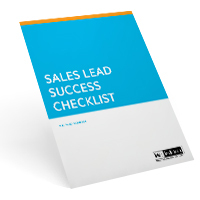 Is one of the goals of your business-to-business advertising sales lead generation for your salespeople, representatives, distributors or resellers? Consider these proven lead generation techniques gleaned from working with over 170 companies and some of the best marketers in the business. Have you seen the ads showing butterflies and oil wells co-existing, illustrating the oil company’s concern for the environment? This kind of advertising may do a lot to improve the company’s image, but it isn’t designed to generate B2B sales leads. If B2B sales leads generation is what you want, focus your advertising’s message on the benefits and applications of your products or services. Then let the layout and design of your ads enhance your company’s image. If you put a benefit in the headline you’ll have a better chance of catching the reader’s attention and generating an inquiry or request for more information. If after reading the headline a reader can ask “so what?” you probably described a feature instead of a benefit. The answer to “so what?” is probably the benefit. If your product or service is ideal for specific applications, say so. When readers recognize their application for your product or service they will be more likely to respond. For example, you’re more likely to get an inquiry from someone in a medical records department of a hospital if they notice that your barcoding software is idea for tracking patient’s medical records. Everyone seems pressed for time these days, including the folks reading the trade publications you advertise in. With this in mind, make it easy for readers to “skim” your ads and still get the message. Use bulleted copy, subheads and illustrations or photos to quickly communicate key points. I’ve seen testimonial ads boost the number of B2B sales leads my clients’ ads generate by up to 700%. However, to be believable you have to be specific. For example, give the full name, title and company affiliation of the person being quoted. Or list the names of a few respected companies who use your products or services. If you use statistics, be sure to back them up by referencing the source of the data. If you want B2B sales leads generation, your advertising needs to be present when your prospects are looking for solutions to their problems. So, if your budget is limited, rather than placing only a few full-page ads a year, consider running fractional ads in every issue. Having ads in every issue also makes your company look bigger and more successful. “Wrap Ads” are actually a number of fractional ads, designed to look like new product announcements, all run on a single page surrounding an “island” half-page ad. This format can also work for half-page and third-page ads. Although more common in tabloid-sized magazines, this type of ad works equally well in standard-sized publications. My clients have found that wrap ads can pull up to 400% more inquiries than a single ad of the same size. If you want your prospects to respond, you have to give them a convincing reason to do so. Keep the phrase “what’s in it for me?” in mind as you’re writing your ad’s call to action. It’s what your prospects are thinking as they decide whether or not they will take the time or effort to respond. It will have a noticeable effect on B2B sales leads generation. Consider offering application notes showing how other buyers solved their problems using your product or service. Offering a useful premium or advertising specialty can also significantly increase the number of responses. However, try to make sure your offer is of interest only to qualified prospects. For example, a tool for sizing rings would be an attractive offer only to people who use rings. However, everyone might want a free pocket screwdriver set and inquire only to get it, not because they have a need for your product or service. Many of your prospects may want to try your product before they buy it. If you can cost-effectively offer samples or a demonstration CD, you will generate more inquiries as part of your B2B sales leads generation program. The word “free” is a powerful inquiry generator. Everyone wants something for nothing. Direct marketers have long known the power of this word. Take a look at just about any direct response ad and you’ll see it used. “New” is another word that is sure to attract attention and generate more inquiries. Legally, however, you can only use “new” if it is new, and only for a limited period of time (usually 6 months). Check with your legal advisor. Any experienced salesperson can tell you, you won’t get the order unless you ask for it. Create benefit-oriented offers such as “call, write, fax, e-mail or visit our Website today to request your free Component Selection Guide, designed to help you quickly determine which products best meet your barcoding needs.” Notice that even the words “Selection Guide,” as opposed to “brochure” or “catalog,” were chosen to offer the reader a benefit. When prospects are just starting to gather information, they may need literature but are often not yet ready for a sales call. When it is almost time to buy, prospects are usually anxious to speak with your salespeople, reps, resellers or distributors, see a demonstration or discuss pricing. You can significantly increase the number of inquiries you generate by making offers that have appeal to prospects in all phases of the sales cycle of B2B sales leads generation. For example, consider offering Selection Guides, application notes, a newsletter, a demonstration, a test or analysis, samples, a sales call or any combination thereof. Direct marketers have found that how you package the offer can be as important as the offer itself. For example, if you’re offering literature or samples, include in the ad a small picture of what they’ll receive if they inquire. If you use a coupon, show a little pair of scissors cutting out the coupon. If you use 800 numbers in your ads, make sure the numbers are big and bold. That way they stand out and it’s clear that you want the prospect to call. Offer multiple response devices so your prospects can choose the method they prefer. For example, some people need your information right away, so they prefer to call or to go right to your Website on the Internet. Some like the 24-hour convenience of faxing or e-mailing their requests. Others find it easier or more comfortable to use the magazine-provided reader service card, coupons or bound-in reply cards. Multiple choices have a better effect on B2B sales leads generation. Art directors tend to hate coupons, but they work. One study I recall showed that the same ads with a coupon out-pulled versions without the coupon by as much as 13%. If you publish phone numbers in your ads, be prepared to answer the phone during coast-to coast business hours. Make it clear to readers that they can get the rest of the story about your products or services instantly by visiting your Website. Then make sure your Website makes it easy for them to find this information. In addition, have an “Information Request” button on every page that takes them to a form that allows them to identify themselves and their needs, and to request that detailed information be faxed, downloaded as files or quickly mailed to them. Consider using a unique web address for each ad you run so you’ll know where the inquiry came from. Ask your Webmaster about this. It is easy and inexpensive to accomplish. The more of these proven techniques you can use, the better your results from B2B lead generation programs will be.